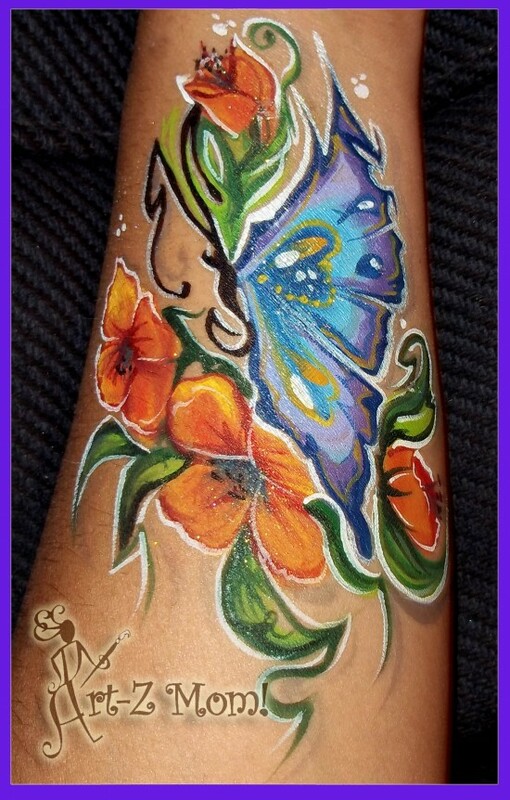 Affordable, high quality, professional and fun face painting! We offer beautiful detailed, & fast designs! We love working with kids and guarantee they'll love us too! 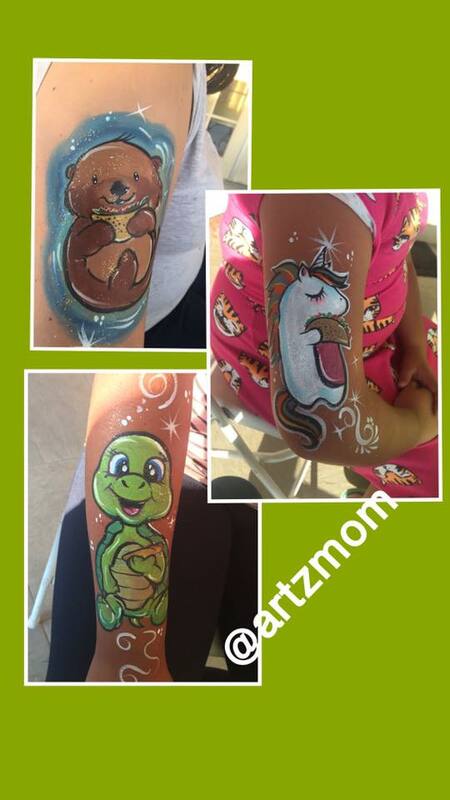 Hire Art-Z Mom face painters for your next special event, you will not be disappointed! We use only the best products that are non-toxic and safe for all skin types. Servicing the Inland Empire and surrounding areas. We offer 1 hour gigs in some areas. Book us today! We're available for birthdays, weddings, corporate events, school events and more! Hablamos Espanol! We offer discounts to schools and non-profit organizations. Hire us during Halloween for private sessions! Let us transform you into just about anything you can imagine! Scoured Inland Empire for months and months, contacted several different individuals and companies about facepainting for my son's first birthday. You could find cheaper "facepainters" that also twist balloons, or even some with slightly cheaper rates..but you get what you pay for. Impress your family & friends and don't waste your time thinking about if you want the balloon twisting, too (I debated hiring someone who could do facepainting & balloon twisting). You don't need balloon twisting with her quality work. My guests still rave about her now..and it's over a year later! Claudia was neither the cheapest, nor the most expensive. Her rates are competitive in comparison to the facepainters in this area..but her work is awesome..she should charge ALOT more..but don't tell her that. I want to book her again at the rate I had her for. lol. It was a big event, full of many fun activities, and I didn't want a crappy facepainter so booked quality because her artwork looked pretty. Even with all things I had planned for my son's party...craft activity, bean bag toss, tire toss, fishing game, jumper, and a big 25 box car kids sat in and raced.... Claudia's facepainting was still the HIT of the party! She was so great with the kids, was very professional, came on time, had everything she needed to setup, and was ready to go! Her artwork..wow! Believe me when I say, the photos don't do her work justice. Her pieces are very dimensional..glitter, shadows, attention to details that make her art pop. It's nothing like your mickey mouse "facepainter" for a day type work. She paints quality stuff. I'm glad I booked her and will be happy to use her again and HIGHLY..HIGHLY..HIGHLY recommend her! We even asked her to stay extra time since the adults wanted in on the facepainting...wish I had time away from hosting to have her paint me a hello kitty. I'm a big hello kitty fan, and she paints one of the best of i've seen. I hired Claudia for my son's 2nd birthday party. I was very impressed by how quick and beautiful her work was. I got so many compliments from my guests and they wanted her information so they can book her for their kids. Thank you so much! You were AWESOME!! I will definitely book you again. Claudia is an absolute joy to have at our events, She's always professional, on time & her work is incredible. I have used her services twice & have been very pleased both times. She's great & patient with little kids & I would definetly use her again!!!!! The Kids in my daycare loved it! Will used artz mom again, she was great!!! Not only was my whole family happy everyone loved us!!!!! Me and my 4 kids were so amazed in ARTZMOM's work. I was asked all night where are your dead kids get them so you can take a pic. I was very please with this service and her patience for my kids. Her work is amazeing and I will definetly be back for more work! We hired ARTZMOM for my daughters first birthday. Claudia was very nice, patient and above all talented! Everyone there was impressed by her work and by her price. She fit everyone in young and old. She didn't rush but was quite fast. I would highly recommend her to all family and friends. Thank you for helping to make my daughters day special. She is an unbelievable talented artist! I can not say enough good things about her services. Was awesome. We had so many compliments. I have and will use her for more parties I highly recommend her services. I had Artzmom come to my sons 1st birthday party just recently 07-30-11. She was a great artist and all the kids loved her! The next day I had parents calling me asking me where they can find her ! Thanks Claudia! ArtZ Mom was awesome! She was the hit of the party, with both kids and adults. She has done two parties for my family, and I'm sure we'll look to her again for the next time we need a face painter! Excellent communication and accommodated my needs. The charges/ services are very upfront and there are no surprises or hidden fees. Artz Mom arrived early to set up and had a very warm personality. Everyone enjoyed her artistic, vibrant and fun face painting. A definite pleasure to work with and would recommend to friends and family. We just celebrated my daughters 1st birthday yesterday December 11th, 2010 and we had ArtZ Mom come paint the kids faces they loved her she was so nice and patient with all the kids she did an awesome job I would definitely recommend her to family and friends!!! I first want to say that the party was a hit. Being that said I went as the sinster seth lord Darth Maul which is seen on Episode I The Phantom Menance. I was amazed and shocked and how much i looked like the character. Not only was I impressed but the people at the party just kept staring in astonishment that The Star Wars foe was in front of them. If anyone was looking to stand out at their next event or party i would give Artz Mom a call. Everything went real smooth from applying the make up to taking it off. Her love for art is what gave her that extra detail that would only come from a professional artist. I want to say to her Thank You and I wish you good fortune in the world of art. My boyfriend and I wanted to be a Day of the Dead couple for Halloween. ArtZ Mom did an amazing job with both of our faces! She takes the time to make sure her work is neat and more importantly, that her client like it. The paint used lasted throughout the entire day, yet it was easy to take off when the time came. The compliments throughout the day were endless. I would highly recommend her services. THANK YOU!!! Claudia was a joy to have at our party and we love her art work. The kids enjoyed her face painting designs, especially the adults! She was on time, so kind, and very professional. I've already booked her services for another event and will do so again in the future. Good Luck Claudia, you're awesome! I used Artz Mom and was very please with her services. She confirmed out dates, Sent me her company link so I could get an idea of the type of face painting she did. She arrived early to the event and had all of her supplys and was ready to go. She was very ppersonalable with the kids and the detail she put into her artwork is impressive. I would definitely use her again. Nikki was great!!! All of the kids were impressed with the tatoos they received and the parents were impressed with the quality of artwork. I also appreciate the accomodations eventhough I booked you on short notice. I would definitely hire you again. Thanks!!! I was extremely happy with the service Claudia provided for my boys' birthday party! Her artwork was amazing and she was wonderful with all the kids and their parents. I received several comments from people at the party about how great she was. She was very professional and accommodating (she painted my son's entire face as spider man!) She did not rush through any of the kids yet was quick enough to make sure every child who wanted their face painted got it. If you are looking for a face painter for your event, I would highly recommend Claudia. We were very very please with Artz Mom. 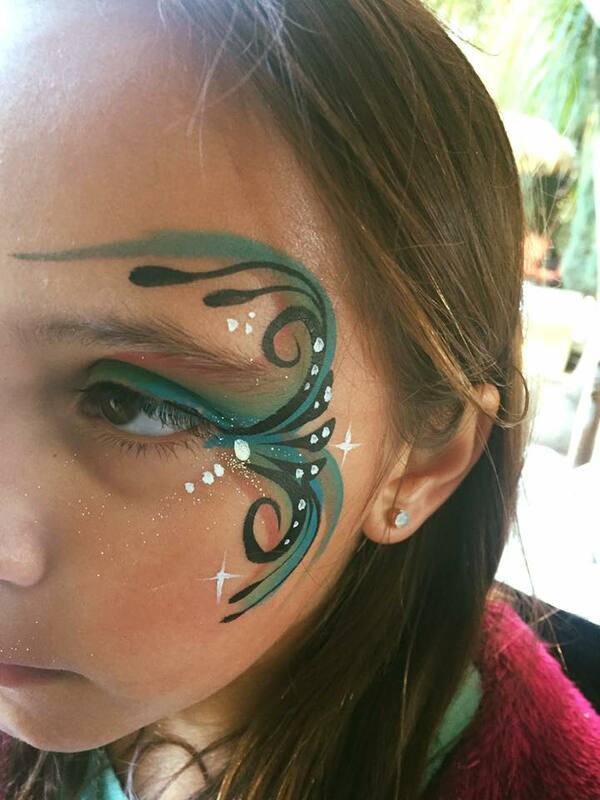 The Face painter I originally hired booked another event the same day as mine in a panic I called Claudia the day before my 1 yr old twins party which we were expecting 100+ guests not only was she able to help me but she was cheaper then the original Face Painter. Nikki was professional, personable and did great work! Thank you for saving the day :) Highly recommend their services! Extremely talented and the children loved her and the children loved her art work. The assistant that did the face painting did beautiful work but had no personality at all and not very lively with the kids or adults. The Alice costume was amazing and very cute but the Alice didn't look to happy as a few of my party goers noticed. I would definitely recommend very good prices and beautiful work the only thing i would do different is make sure the owner Claudia would be the one to come out. 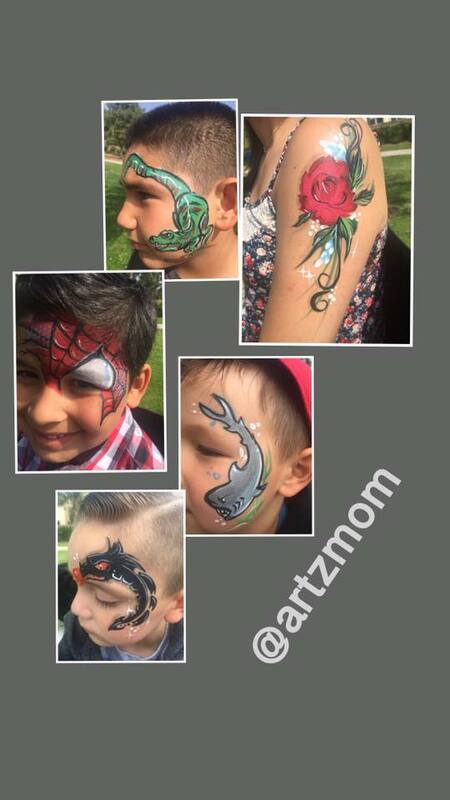 Price Range: "$80.00 - 500"
Thank you for considering Art-Z Mom Creative Face and body art for your special event. 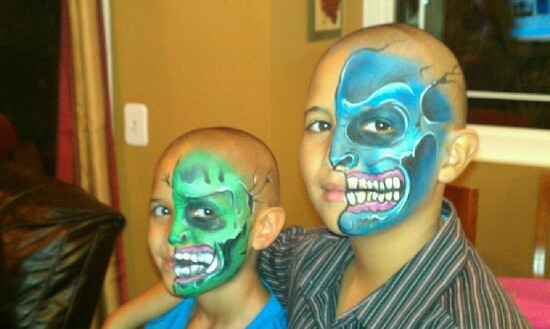 We book for all occasions and can typically paint 10-15 face per hour for private events. We also offer speed painting for corporate or big events. We do require a two hour minimum booking. We are two dedicated artists with many years of experience working with kids. We consider no project too small or too big and take pride in our work. We carry liability insurance and only use FDA compliant products safe for all skin types. We offer very affordable pricing so that anyone can enjoy making their project ideas a reality! I believe art should be for everyone to enjoy! My Bio: Thank you for taking the time to view my Bio. I started my business back in 2008 when I left my career to be a work-at-home mom. I made the decision when my second child was born and diagnosed with mild-autism. I realized I needed to use the two most wonderful gifts that God had given me: being a Mom and an Artist. working as an Artist, Illustrator and Designer while raising my kids. Forward to ten yrs. I now presently work part time as an artist, and part time a an Art Instructor for a charter school teaching fine art to over 800 students in grades TK-8th. I love both of my jobs and have always enjoyed working with kids and have over 20 yrs experience working in schools. My niece who is my assistant has been painting with me for almost ten years and she does a phenomenal job and is very reliable. Again we hope you consider us for your next event. We provide our own table and chairs, all we need are smiling faces to transform! Only need an area with good lighting but no direct sunlight.